Salads can get a little boring, especially when you have kids who are picky eaters. 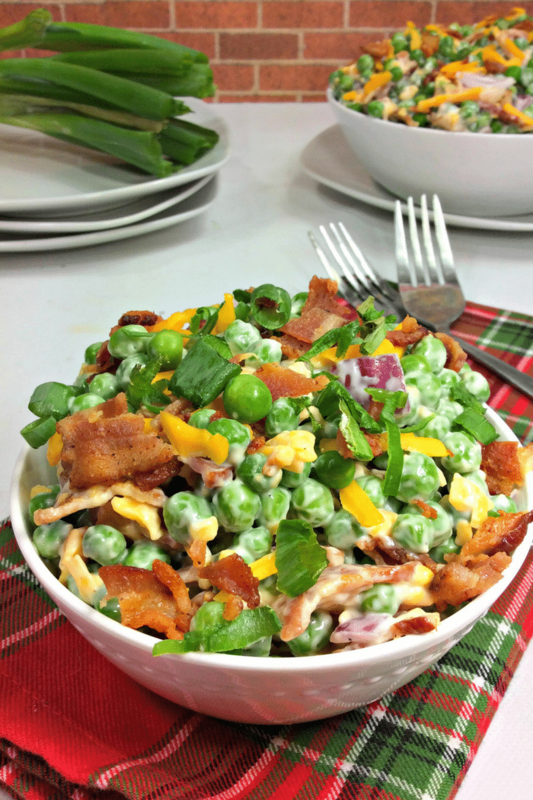 Why not change things up with this sweet pea salad recipe with bacon? You’ll be sure to have your whole family’s attention with this easy side dish! This salad is perfect for your repertoire of no-brainer meals! The ingredients, which are listed below, are so easy to find in your local grocery store that you won’t have any trouble stocking up for your kitchen. In fact, you might already have them right now! 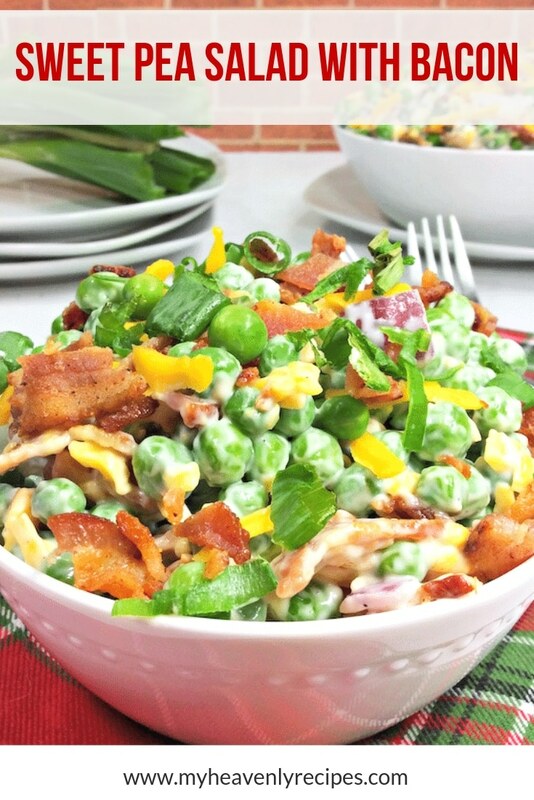 Sweet pea salad is super easy to make! This recipe needs very little time and effort to whip up! Your kids can easily help you make it for lunch or dinner over the weekend. Make it for your BBQ, holiday and buffet parties, potluck dinners, picnics, and lunchboxes! This salad will easily go on rotation for all your meals and become a go-to side dish, especially for busy families. 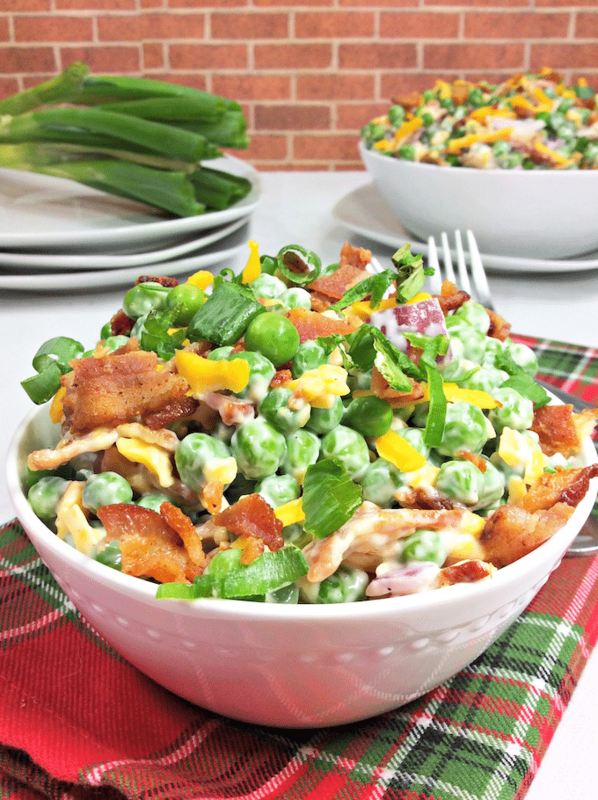 Make salads exciting for the whole family by adding everybody’s favorite – bacon and cheese! Do you have picky eaters in your brood? 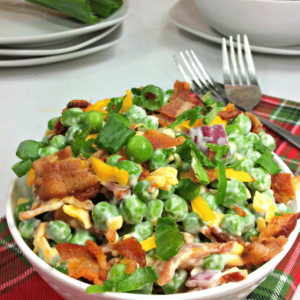 They might not be able to resist this sweet pea salad recipe… especially if you’re generous with the bacon and cheddar. Whoever said that eating healthy had to feel like punishment? With this recipe, your kids might think differently about all kinds of salads. Loving what you’re reading so far? Then it’s time to give this recipe a shot! 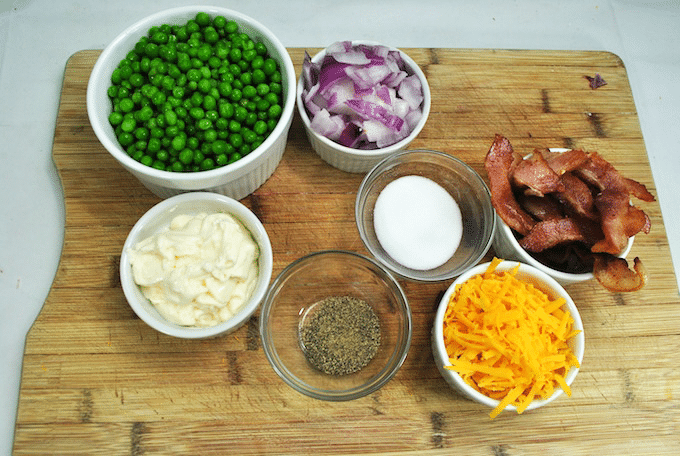 The sweetness and plumpness of the peas add more texture and flavor to the salad compared to simply using leafy greens. Bell peppers lend bright and fresh colors to your sweet pea salad recipe and pump it full of antioxidants. Crisp bacon adds a savory crunch that the whole family will love. Nobody can say no to bacon! Don’t toss and mix the ingredients together too much. Overdoing it can overmix the flavors, making each ingredient hard to distinguish. Let those ingredients shine! If you’re bringing the salad to a potluck or gathering, make sure you store the salad in a cooler to keep the optimum temperature until serving time at the venue. This salad is meant to be served cool! Afraid of making the bacon soggy? You can always prepare the whole salad and add the bacon later on to make sure it’s still crispy. Does your family LOVE cheese? 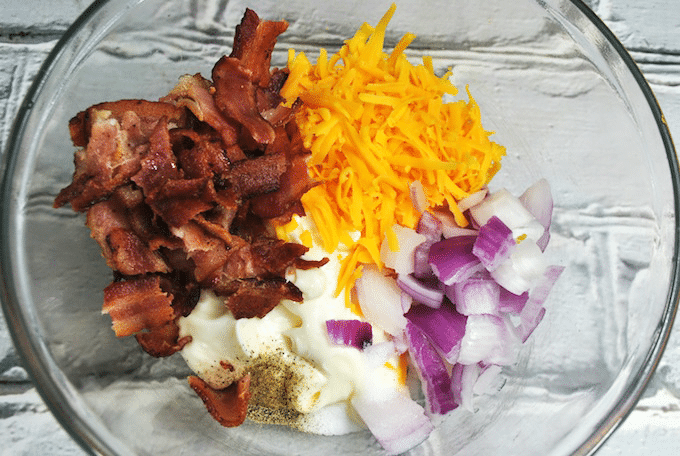 Then whip up this salad with chunks of sharp cheddar! Chopping them up in cubes instead of shredding them gives another dimension of texture and a cheesy surprise to bite into. Making the salad this way makes it even more kid-friendly and will definitely entice your little ones to eat more greens. Want to change up the mayonnaise dressing? Add some sour cream to the mix with a little vinegar, salt, and pepper. Makes it a little fancier, don’t you think? Hard-boil a couple of eggs, chop them, and toss them together with the salad. The eggs add to the creamy texture of this salad. 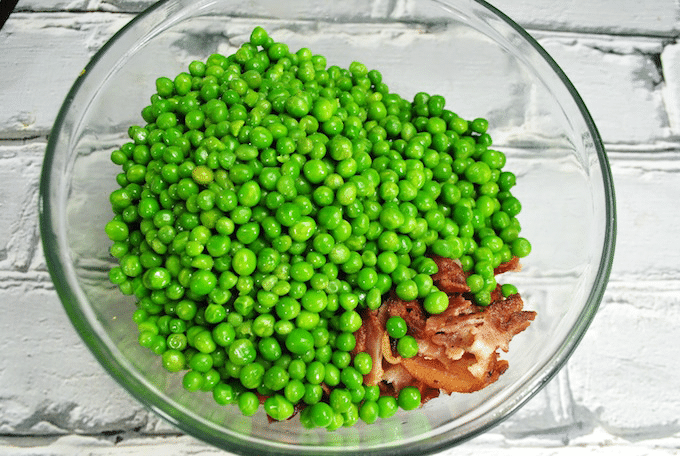 Place the frozen peas in a large bowl. Rinse the peas with water to remove the frozen layer. Add the cheese, bell peppers, red onion, and mayonnaise. Lightly stir to combine. Top with Kosher salt, black pepper, and bacon. Toss together until combined. Place in the refrigerator for 1-2 hours. 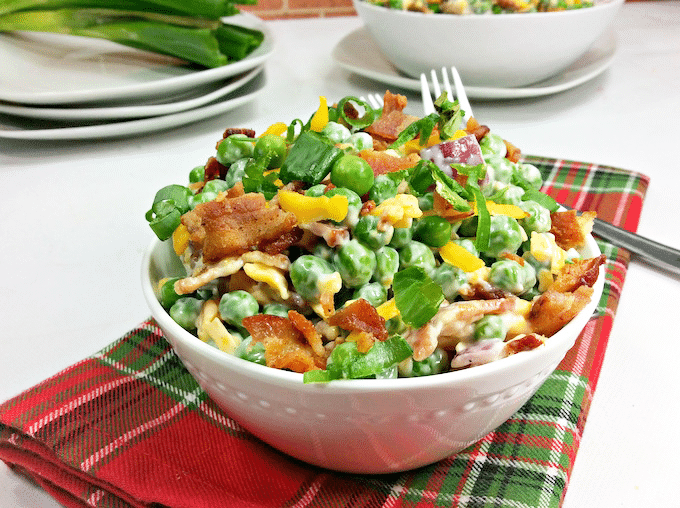 This sweet pea salad recipe with bacon is not only healthy, but also extra delicious and so easy! You will want to add this to your meal rotation for sure. Makes about 8 cups. Place the frozen peas in a large bowl. Rinse the peas with water to remove the frozen layer. Add the cheese, bell peppers, red onion, and mayonnaise. Top with Kosher salt, black pepper, and bacon.